Home :: Necklaces :: N0080 - Wild Prairie Rose - 18"
On those casual days when you just want to drive with the top down and let the wind blow through your hair this is the perfect accent to your wardrobe. The soft pink glow of the Rose Quartz dotted by the rich green Peridot will warm your spirits. The necklace's crowning glory is its 20-mm Cloisonné donut decorated with the three wild roses. The Wild Rose has long been a symbol of America's beauty and pioneer spirit. What better symbol than the Wild Rose for the woman of today to wear around her neck. necklace with 14 kt gold filled Lobster Claw Clasp. 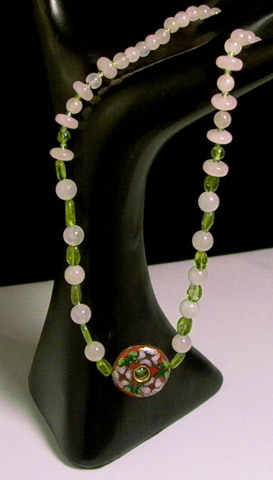 5-mm & 7-mm round Rose Quartz, 8-mm rondel Rose Quartz, Peridot oval beads and 20-mm Cloisonné donut.